Chickpeas are my culinary soulmate. If I could just have one main ingredient to cook with for the rest of my life, my choice would be simple. I might give lentils some careful consideration, but ultimately, I’d choose the star ingredient of falafel, hummus, salads, soups, croquettes, curry, and so many other things. My favorite hummus for years was Tribe of Two Sheiks, then I fell for the heavenly creamy texture of Sabra hummus, which developed into a spendy Trader Joe’s hummus habit. Parallel to my love affair with commercially prepared hummus, I was trying to nail a decent recipe of my own, but it usually had too much tahini, too much garlic, not enough garlic, an off texture, or was generally missing something. Many kilos of chickpeas later, I hit on this recipe, which is perfect to my taste. It’s creamy, light on the tahini, uses roasted garlic for a mellow garlic flavor, and citric acid, because that’s what was missing. Using a food processor with the blade attachment, blend everything except the chickpeas and the olive oil. I don’t know if this is an official fact, but I swear the secret to creamy smooth hummus is blending the liquid ingredients before adding the chickpeas and olive oil. Add the chickpeas, then let the processor run while drizzling the olive oil through the feed tube. Let it run for several minutes, stopping a couple of times to scrape the sides. I usually let it run while I’m washing the measuring cups, spoons, etc. 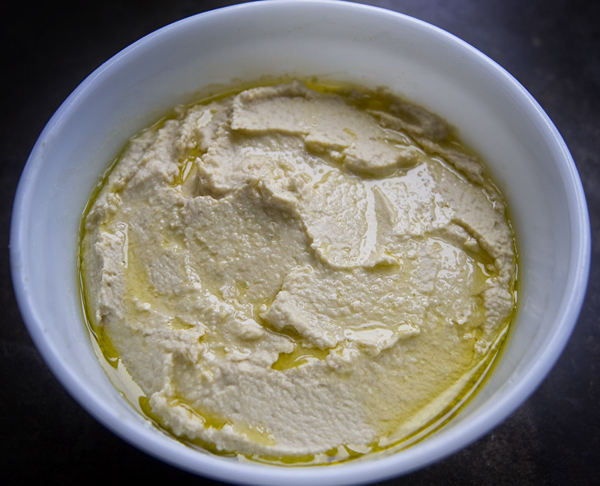 Once the hummus is smooth and lovely, I spread it into a bowl, and drizzle a few tablespoons of olive oil over the top. Then, in theory, I refrigerate it for at least a couple of hours, or preferably overnight. Truthfully, unless it’s for company, I’m usually in there long before it has a chance to chill. My favorite way to eat it is on my homemade pita chips, or with its cousin, falafel! I LOVE garlic hummus! This sounds so easy but now to try and find citric acid! Thanks for sharing the recipe. Why not lemon juice instead of citric acid, Sage? Lisa, Using just lemon juice didn’t give me the slight sour note I wanted before the lemon taste became overpowering. Too little lemon/citric acid, and I think the tahini is too prominent. I got the idea to try citric acid by deconstructing the ingredients list on a tub I’d bought. Your recipe states to add all of the ingredients except the chickpeas and olive oil. Does this include the 1/2 cup of water used to boil the chickpeas?